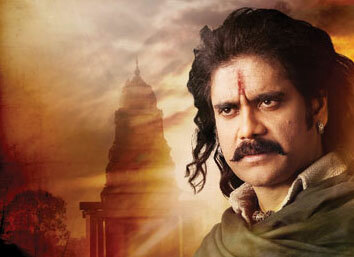 I have seen Rajanna film and I am thrilled and happy about the final product. I am eagerly waiting for the box office result. Initially we planned it for 30 September release, but got delayed due to computer graphics work. Then the distributors asked us not to release the movie in October/November as it is an off-season for films. Hence, we are gearing up for the x-mas release which has been my lucky season in the past (Mass, Manmadhudu, Don, Satyam etc). Malamma is the daughter of Rajanna. Her mother dies when she was a kid and her father dies too. She hasn’t seen her father. She belongs to Nelakondapalli, a village in Adilabad district. Since she is a parents-less child, the entire village adopts her. But only one thatha (grand old man) knows that she is the daughter of Rajanna. He makes sure that her secret is protected as the village heads will kill her if they come to know that she is the daughter of Rajanna. Mallamma likes to sing. The lady belonging to village head (dorasani) sees Mallamma singing beautifully and bans her from singing. The landlady sees Mallamma singing again and she goes after her. Thatha takes Mallamma away in train. Mallamma has so much attachment to village that she jumps out of train and returns to village. She admire Rajanna though she doesn’t know that he is her father. There is a basil plant (thulasi chettu) in memory of Rajanna in that village. Mallamma feels affinity towards that place. That is when thatha tells Mallamma that she is the daughter of Rajanna. She wants to be saved. That village was not a part of India at that time. The nawab of Nizam was jailed. It was dominated by the few ill-willed Rajakars. She comes to know that only Nehru can save her village from the clutches of bad landlords and evil-minded Rajakars. She realises that Nehru is fond of kids and songs. She goes to Delhi. She comes to know that there is a singing competition which will be graced by Nehru. She plans to participate and win that competition to get the attention of Nehru. She writes a letter to her villagemen to listen to her song on radio. Eventually, the postman delivers to the letter to landlady. She threatens Mallamma’s music guru and finds out the whereabouts of Mallamma. She goes to Delhi with her men and captures her. The competition is going to kick off in a few hours. Mallamma is disillusioned and accepts her defeat in front of her guru. He then inspire her by narrating the story of Rajanna. Rajanna is an inspiring youngster who fights with British for the independence. He has four good friends (a Muslim, a Maharashtrian, a Punjabi and a Tamilian). They fight british with their own kind of warfare. When India becomes independent, they decide to bury their weapons and live a peaceful life. While returning to his home place, Rajanna witnesses atrocities being committed by landlords (doralu) and a few rajakars. He realises that there is no freedom though the british left India. In stead of fighting on his own, Rajanna decides to create revolution by involving village-men. The rest of the story is about how guru inspires Mallamma to fight back and what happens next. On a whole Rajanna is a high voltage emotional and very-well shaped film. If I have to describe the entire film in a single sentence I would say - Story of a father and daughter who struggle for freedom. I feel that Rajanna will become a milestone in my career. 1. We had a fort set erected in a floor. The scenes shot in that requires lot of CG work. 2. The village of Nelakondapalli is also a set. It was all done with clay and with no cement block. 3. We have also created a British fort set. SS Rajamouli has offered to do a few emotional vital sequences in this movie. He likes the story so much. He has also warned me that the cost is going to be doubled. I have gladly agreed to a higher budget film because I get value for money when SS Rajamouli shoots something. He has shot ‘Vey’ song for 15 days. It will be one of my career highlights. The climax fight of the movie was shot by SS Rajamouli for over a month. A special thing about SS Rajamouli is that he does every stunt in the film by himself before handing it over to the actor. He is a very pateint when it comes to extracting work from the artists and technicians. It’s no wonder that he is at the top of his game today. The get-up of Rajanna is designed by Rama and SS Rajamouli. Rama designed my costumes in the film. Is Rajanna based on a real story or it is a fictional film? The vital characters are inspired by real people who existed in the history. For example, Rajanna character is inspired by Suddala Hanumanthu (father of lyricist Suddala Ashok Teja). Suddhala Ashok Teja told ‘Vey’ song penned by his father and the situation ten years back to the director Vijayendra Prasad. It inspired him so much that he has amassed a few real incidents and has woven a fictional story around it. I can say that the vital characters and and incidents in this film are taken from history and a fictional film is made out of it. Tell us about the kid? Her name is Annie and she is a wonderful actress. She has donned the role of a small girl in Vikramarkudu film in the past. I feel bad that I share no scene with her in this movie. Tell us about Keeravani’s work? We have done over 16 to 17 films and most of them are musical hits. I love all the songs. The background music is 100% more powerful. I want to release the background music as a freebie on internet after the release of film. You are doing special films like Prayanam, Rajanna, Dhamarukam and Shirdi Sai. What is the reason? I don’t want to do pure commercial films any more. I want the roles I am doing from now on to be remembered. That thought triggered me to accept different films like these. Tell us about your futute projects? I am currently doing Dhamarukam. My part of the shoot will be complete by 23 December. I will start shooting for Shirdi Sai film from the end of January. I am growing my beard for that. Dasarath is going to direct a family subject later. I gave him ample time to prepare a subject with a difference. Siva Prasad Reddy will produce that movie. Tell us about Naga Chaitanya films? Naga Chaitanya is currently doing Auto Nagar Surya film. I have listened to the script. It’s fantastic and beautiful. He will do a family subject Gouravam on Annapurna banner in the direction of Radha Mohan (Aakasamantha fame). It is going to be a bilingual (Telugu and Tamil) to be shot in village atmosphere near Rajahmundry. It is the story of a city boy in a village. When is Akhil making his debut? I am not putting any pressure on Akhil. I wholeheartedly encourage him to do whatever he likes to do.